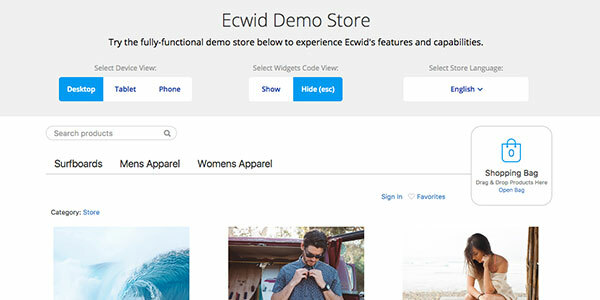 Perfect for those who already have a website and simply want to add an eCommerce platform, Ecwid can create a fully functional store in a matter of minutes. With fast, flexible functionality and plenty of features to support the unique aspects of your business, Ecwid lets you launch a dynamic shopping option that works seamlessly across any device. Ecwid is perfect for small business owners with an existing website in need of a simple, streamlined eCommerce store. For small business owners seeking an integrative solution, Ecwid has a lot to offer. Short for “eCommerce widget,” Ecwid isn’t intended to be a standalone eCommerce site — although the option is there for companies starting from scratch— but, rather, it’s an online store option that can be inserted into any existing site. Compatible with Wix, Weebly, Joomla and dozens of others, it’s possible to add to your current site with minimal effort. With a section of HTML code that can be dragged and dropped into a new website page, Ecwid lets even novices to site management add a store with ease. 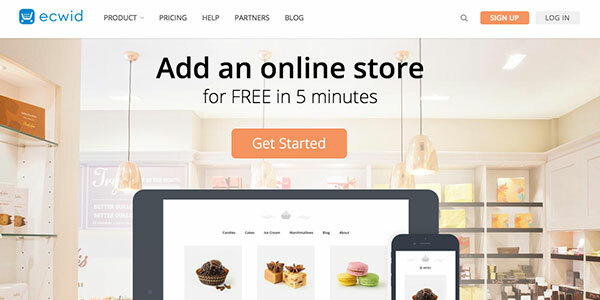 Ecwid makes it easy to get started, allowing users to launch a new store in minutes. All features are user-friendly, providing a simple way to assign images, prices, product descriptions and more. Furthermore, Ecwid stores are fully responsive, appearing seamlessly on every device, regardless of size or operating system. Ecwid is an incredibly flexible program, allowing small business owners to find a fast solution to eCommerce hosting. Plans come in four types, with plenty of options from simple to comprehensive. Free plans start with 10 items, online and Facebook stores, and unlimited bandwidth. Unlimited plans go much further, with unlimited items, a custom mobile app, Square POS integration, and Google and eBay integration. With prices maxing out at $69 a month, even businesses on a budget can host a full-service store without breaking the bank. A lot of small business solutions have significant limitations, but Ecwid can be as thorough as you like. If you want to go above and beyond, Ecwid offers plenty of options. Site owners can do everything from choose shipping providers to keeping an address book to making future contact easy. Collect email addresses for marketing needs, design coupons, provide promo codes and more. Best of all, there’s no software to install, so setup is quick, clean and efficient. Customization is a big part of an effective eCommerce space, but this is where Ecwid falls short. Options to personalize your site are fairly limited, with a few preset options for companies who want to expand beyond the confines of a white background. More options are available for those who have some computer skills, giving users an easy way to break away from the basics. However, most small business owners aren’t necessarily knowledgeable in CSS, which is required to change designs and structure significantly. Ecwid excels in the payment processing space, providing a myriad of options from which to choose. With over 50 payment portals available, small businesses can utilize as many opportunities as desired, including all major credit cards, Square, PayPal, Stripe and First Data. 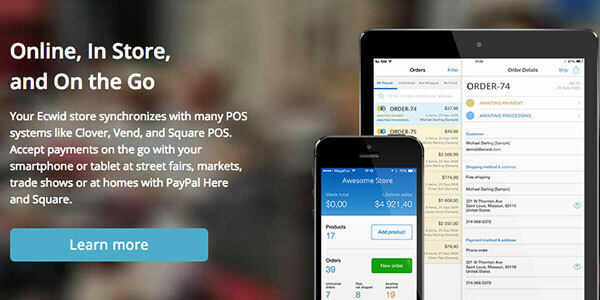 Credit cards are processed through PayPal for a 2.7 percent transaction fee. SEO tools aren’t a priority for Ecwid. This is largely due to the format of the site: Because Ecwid isn’t a standalone platform, there’s no real need for tools to boost exposure. Some options are available, however. Site users can provide meta titles and descriptions to optimize search engine results, and URLs are designed to be SEO-friendly. The free package is extremely limited, but paid plans provide additional features, including social media integration. The SEO tool limitations aren’t really a drawback. As an eCommerce add-on to an existing site rather than an independent platform, users don’t need the expansive options other site builders must offer. As a third-party add-on to an existing site, hosting isn’t really an issue for Ecwid. Users rely on the host for their pre-existing website, putting the control entirely on shop owners. Security is a factor everywhere, and Ecwid offers some option for peace of mind. The platform is PCI DSS Level 1 certified, the gold standard in online security, guaranteeing the safety and protection of customer information. Customer support is a big part of maintaining a stable, accessible eCommerce site, and Ecwid offers a few options to ensure users are always in the loop. While support is regularly available, to what extent depends largely on the selected plan. Free users receive custom onboarding assistance but are limited to online support tickets moving forward. Options improve as plan levels become more comprehensive: Live chat is available for Venture plans, live chat and phone support are options for Business plans, and Unlimited users can benefit from live chat, phone support, priority assistance and 12 hours of custom development. While the platform is largely issue-free, problems do arise from time to time. Response is quick for paying customers, but those with free plans often find themselves waiting for assistance. 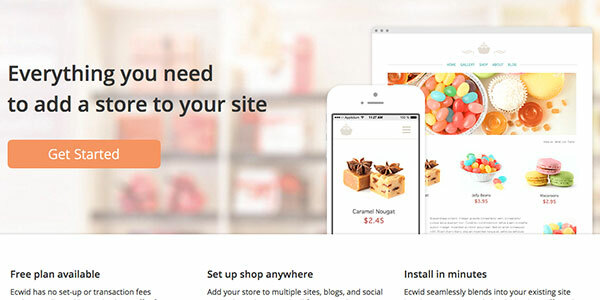 With an easy way to add eCommerce functionality to any existing website, Ecwid provides an efficient solution for small business owners uninterested in building a store or eCommerce site from the ground up. Site setup can be completed in a matter of minutes, and publication is instant. Compatibility is guaranteed through nearly every site builder, as well as social media platforms, allowing users to share one store through virtually every portal possible. Payment and shipping options are diverse, providing everything necessary to succeed in online sales. While Ecwid isn’t perfect — customization options leave a bit to be desired — the platform is a solid option for those on a budget seeking a high-quality way to move forward with online sales. Ecwid, short for eCommerce Widget, launched in 2009 and has been successfully redefining the eCommerce experience ever since. Founded by Ruslan Fazlyev, the co-founder of the first-ever PHP eCommerce platform, X-Cart, in 2000, Ecwid was introduced as a modern eCommerce solution to accommodate small business needs. Ruslan’s X-Cart experience taught him that many small businesses aren’t searching for brand-new websites but rather a way to add an eCommerce page to an existing site, and this is exactly what Ecwid provides. With headquarters in San Diego, California, and Ulyanovsk, Russia, Ecwid provides service to over 1,000,000 stores in 175 countries around the world. Designed for small business use, Ecwid makes it affordable to add eCommerce functionality to any page.